Jupiter appears to be smiling at the solar system in this image created by citizen scientist Randy Ahn, using data from Juno's JunoCam instrument. 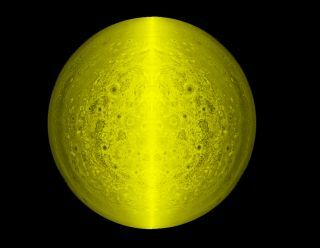 In JunoCam's view, Jupiter is only half-lit, so Ahn copied the image and flipped it to create a fully illuminated circle. Jupiter appears to be flashing a big smile at the solar system, in an image that was created using data from NASA's Juno spacecraft. On Aug. 27, the probe made a close pass by Jupiter, and an instrument called the JunoCam took some snapshots of the half-lit planet. Those data are made available to the public, and citizen scientist Randy Ahn mirrored the image to create a fully illuminated circle. He then processed the image in such a way as to give it the yellow tint, and bring out features that seem to create two eyes and a smiling mouth. The JunoCam instrument's primary purpose is to engage the public and send back images of the planet that are taken in visible wavelengths of light (those that the human eye can see). Different image-processing techniques conducted by other citizen scientists have highlighted different features on Jupiter, including many swirling storms. Scott Bolton, Juno's principal investigator, from the Southwest Research Institute in San Antonio, announced some early results from the Aug. 27 flyby at the 2016 meeting of the American Astronomical Society's Division for Planetary Sciences in Pasadena, California. But Bolton said that any deep scientific analysis is yet to come. Juno was supposed to fire its engines on Oct. 19 in order to shorten its orbit around Jupiter from 53 days to 14 days, but a problem with the engine valves has delayed that maneuver indefinitely.